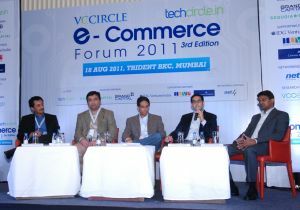 The third edition of the VCCircle E-Commerce Forum saw discussions regarding the potential, challenges and the success mantra, currently ruling the e-commerce space. And it was, indeed, a hit, both in terms of turnout and the quality of information shared. The panellists gave an insightful view of the current trends in the e-commerce space in India and what the future might hold in store. The opening panel â€“ The Indian E-Commerce: A Status Check & Where Are We Headed â€“ mainly focused on the scope, challenges and the current state of e-commerce in India. It was moderated by Manik Arora, MD, IDG Ventures India, and had HomeShop18, Google India, Infibeam and e-Bay India as participants. Arora began the discussion by stating that India has already witnessed venture capital investments in excess of $500 million this year and this number could easily cross the $1 billion mark by the end of the year. Half of this amount had been invested in the e-commerce sector. According to Sundeep Malhotra, CEO of Home Shop18, the potential of growth and scale is huge in India. "There are more than 5000 cities in the country out of which 2,800 cities are yet to have proper roads." This clearly shows the potential of online retail. Gautam Gandhi, head of business development at Google India, also shared some interesting facts. There are more than 100 million PC Internet and more than 14 million mobile Internet users in India â€“ which might give rise to m-commerce as well. As there are more than 800 million mobile subscriptions and counting, India will be in the forefront of mobile commerce very soon, feels Malhotra. B. Muralikrishnan, country manager with eBay India, was also of the opinion that the lines between online and offline business is blurring in the country, thanks to the rise of smartphones. According to Gandhi, the potential for e-commerce is huge in India. "We play the role of an intermediary; we are all entering new territories and will witness how online and offline will meet each other in the near future." Malhotra of Home Shop18 said, "Although capital and finance are readily available, lack of talent, infrastructure and logistics would still pose a challenge. But the biggest challenge is the lack of credibility and trust. Companies need to build customer confidence for better acceptance of e-commerce." Discussing at length the challenges facing the ecosystem, Muralikrishnan said, "Scalability at various levels is the biggest challenge for Indian e-commerce. Additionally, innovation and not replication is the key for building a successful e-commerce business. India does not need an Indian version of an Amazon. What it needs is something unique." He also stated that although cash-on-delivery would remain the most successful mode of payment in India, it might be extremely problematic for the merchants. Hence, a new payment method is required that will work for both customers and retailers. While everyone agreed that finding the right talent is difficult yet important, Infibeam's founder Vishal Mehta said, "Being headquartered in a tier II city actually helped since the top talent of the city automatically came to us." "As a culture, we foster innovation. E-commerce is about flawless execution, trust of consumers and there may be a lot of issues to simplify now," added Mehta. He also stated that books were an important product category for online retailers and Infibeam made a mistake by not entering it till now, but added that they would do so in the coming days. So, what should ultimately lead to e-commerce success? The second panel at the forum â€“ The Rise Of New E-commerce Categories: Can They Scale â€“ seemed to offer quite a few practical solutions. Moderated by Vani Kola, MD of IndoUS Ventures, this session saw some insightful participation from start-ups Inkfruit, CaratLane, Babyoye and the VC firm Sequoia Capital. The discussion focused on the challenges faced by new e-commerce ventures and must be done to overcome those. "Value on delivery has to be taken care of; it is mandatory for all the e-commerce companies to make it a priority," said Kashyap Dalal, CEO, Inkfruit. He also stated that e-commerce companies should focus on providing high quality products. "If the end-product is good, the business will eventually scale up." Speaking from personal experience, Mithun Sacheti, MD of CaratLane said, "CaratLane had just three transactions in the first three months of its launch. Hence, patience is the key for growing any e-commerce business." He added that the companies should not be worried about the sales numbers initially. Instead, they should focus on product quality and customer experience, which would ultimately lead to business success. While talking about the risks in the e-commerce sector, Sanjay Nadkarni, founder & CEO of Babyoye, emphasised that e-commerce ventures were not riskier than offline retail, as the failure rate was the same for online and offline retail. Incidentally, Vani Kola ended the panel with an interesting exercise where the panellists predicted what would happen in the e-commerce sector in 2012. According to Kashyap, customers would become more comfortable with electronic transactions by 2012 while Sacheti predicted that the number of serious online buyers could go up to 18 million in 2012, from the current nine million. Shailesh Lakhani, vice-president of Sequoia Capital, predicted that India would witness the entry of foreign competitors by 2012 while Vani predicted that there would be one or more $1 billion exits in India by 2012. Although e-commerce companies in India face a number of issues â€“ lack of talent, infrastructure and logistics challenge and building credibility and customer trust, all the panellists agreed upon the fact that the e-commerce boom is here to stay. While companies need to build relationships with the customers, innovation is the key that will drive the e-commerce initiatives in the country.